Should you just pick a row or sit and wait for someone to come out? When it comes to finding a parking space, some strategies are better than others. Wherever you go, you must first park your car. Easier said than done — especially on a huge shopping day like Black Friday — but when it comes to finding a space, some strategies are better than others. 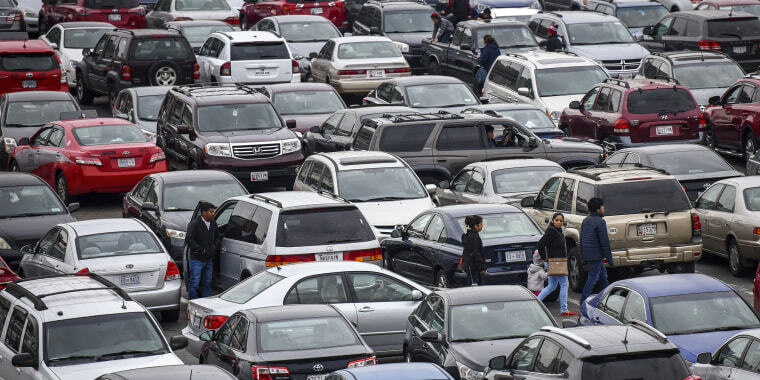 It’s something Andrew Velkey, an associate professor of psychology at Christopher Newport University in Virginia, saw over and over again when he observed people’s behavior in parking lots. What's the big deal about Black Friday parking? Why do we devote so much energy to finding a good parking spot in the first place? We’re obsessed even when the weather is nice and walking a short distance would be good for our health. We also tend to misjudge the availability of good spaces. When you do find a perfect spot, it’s a memorable event and makes you overestimate the likelihood of getting one the next time around, so you keep searching, he noted. For some of us, it’s also a habit. 1. The active search: Drive up and down the rows, and look for a spot closest to the door. 2. Pick a row, closest space: Enter any row and park in the first vacant spot you come across. And the winner is: No. 2 — Pick a row, closest space. You’ll get to the store quicker. “People who drive up and down the rows looking for a closer space… spend a lot of time looking, but when they actually park their car, they’re no closer to the door, on average — distance wise or foot travel time wise — than the people who use the other strategy,” Velkey said. Men were more likely to use the “pick a row, closest space” strategy, while women were more likely to actively search, he found in his observations of a suburban Wal-Mart parking lot. 1. The active search: Drive up and down the rows, and if you don’t find a spot, go on to another parking lot. 2. Sit and wait: Drive into a parking lot, then sit and wait for someone to come out of the store and vacate a spot. And the winner is: No. 2 — Sit and wait. It takes more time, but there’s a greater chance of success. “People who use a sit-and-wait strategy were investing 8-12 minutes, typically, waiting for a parking space, but they almost always got a parking space,” Velkey found after observing a chronically overcrowded university parking lot. Active searchers were successful in finding a spot only about a third of the time, but they only spent two or three minutes in the lot before trying their luck elsewhere, he added. Most people will park in the row directly in front of the store door, no matter how far away the space is. Consider the next row over, or park in the periphery of the lot and you’ll likely be closer. When you’re waiting for someone to vacate their space, don’t be too insistent. One study found people who saw someone waiting for their spot took longer to pull out, and were even slower to leave if someone honked. People can treat a spot as their territory, Velkey noted. They’re also a bit like animals foraging for food. Tensions can arise when there are lots of individuals competing for a limited resource. Parking rage is real and thinking “I’m going to win, I’m going to get this space” may lead you to make bad decisions, he added. “Try not to make it a competition. Realize that good parking spaces don’t happen very often and quit trying to find them so much,” Velkey said.